My 30+ years work as an intuitive-aromatic-energy therapist is one of my great joys, and I feel extremely grateful to all of my clients who allow me to be a part of their healing journeys. Awakening the I AM presence and releasing that which does not align with it is the core of the work that I am called to do. This is Soul Alchemy of the highest order, and life transformations occur by way of it. I am not a practitioner to work with if you are just curious to receive some surface updates, are not prepared to face such change, or are just looking for a quick energy fix. Having said that– my utmost desire is to hold a sacred, healing space for your re-alignment with your soul’s path, and all our work will proceed safely… from heart to heart. You will receive that which you need. This is my promise. In my case– it begins along the lines of that really good friend who listens to you, then progresses as I work with both of our guides on your behalf– to help you access your own inner wisdom, blocked– most likely– due to some experience or trauma that has separated you from your natural state. My purpose is to hold for you the highest point of light– so that you can remember that presence– and allow the healing that you seek, the wisdom that you desire, the release of the pattern, the miracle you seek to come forth. I am only holding for you to remember what you have forgotten, to invoke your innate talents and abilities, and to reclaim your inner strength and personal power. I see past the perceived limitations of outer experience and deep into the soul’s powerful, unadulterated energy. Energy work can be done in-person or long-distance, and the results will be the same. * $135 (up to 1 and a 1/2 hrs, any combination of any of the below-listed types of treatment work, plus or minus exceptions). Add $45/each addl. half hour or part thereof. * Personal Tarot session $100 (1 person, up to 50 minutes). * Business Tarot Consultation $135.00 (up to 1 ½ hrs). Add-on Personal readings to the Business Reading are an extra $35.00/person/15 min ea. 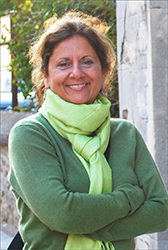 * Intuitive Aromatherapy Session– $350 (up to 1 and a 1/2 hrs, **includes custom, personalized fragrance/blend) on up. * Environmental Clearing/House Cleansing/Blessings $135/hr. (1 hr minimum)(incl. travel up to 30 miles). Price (time) determined by size of house, distance, etc.). Call 785-550-9563 to determine pricing and to schedule. * Note to First-time Clients: You can save time by downloading and printing out my Client History Sheet, and bringing it with you (or mailing/emailing the information, in the case of long-distance work). The Intuitive Energy Session is for the person seeking assistance with some pattern or challenge that keeps recurring. We work with uncovering and dissolving patterns and energy blocks that may be keeping the pattern or experiences repeating themselves. This is usually the starting point and foundation of our work together. From there we may add some combination of the following treatments and tools, to assist in the recovery of healthy patterns. This session can be done in-person or long-distance. The release of blocked or unwanted energy allows for the alignment of the internal and external energetic pathways– the chakras, the auric field– and the raising of the vibrational frequency of the body, mind and spirit, into harmonization and balance with Oneness and unity. The Emotional Release Treatment can also include anointing the body with aromatic blends, a crystal lay-out, flower essences, drumming/rattling, as needed, while also potentially using the energy of the bio-mat atop of the sound healing bed. Wearing a beautiful scent that aligns with you heart-dreams and goals can help you achieve all that you desire to experience, while at the same time releasing old patterns of beliefs and empowering new ones. The client learns how to anoint the body with the fragrance and to use it to empower that which desires to be created. Note: As stated above– this session is $350 (up to 1.5 hrs) on up, and includes a custom, personalized fragrance/blend, aimed at facilitating further support, growth and healing. Note: As stated above– tarot readings priced at $100 (up to 50 minutes). The Shamanic Healing Session is for those who are seeking deep soul work and have a need for a soul retrieval or for a past life regression, as well as for any person seeking a connection with their spirit guides, animals, or a journey into non-ordinary reality to align with their soul purpose. I like to combine energy work with dance therapy as a way of completing and assimilating cleansing of the old, and awakening and grounding of the new soul energy. “While the body dances…the soul trances.” –- Doctor Trance. Art Therapy Sessions are a beautiful way to capture what one is feeling through the use of color, music and scents, and can be used in combination with an energy, dance or other session. Many times– by working with color, scent and sound– we can open up communication between the different parts of the self in a manner which is perceived as highly safe, perhaps less invasive or triggering, yet still majorly effective. Price determined by size of house, number of hours, distance, etc. Minimum $135.00 (up to 30 miles). Call. I am available for private commissions and consultations on creating sacred space and altars within homes, businesses, and on the land. Using a variety of different techniques and my intuitive skills helps me to create a sacred space for those who desire a more empowered, conscious energy surrounding and embracing their life style, goals and sacred intentions. 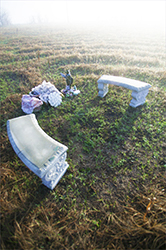 Think feng shui, think placement, think interior and landscape design. in supporting your unique, authentic essence to emerge.This is my wish for you. 1. Stating your intention to, or making your request of, the Universe as you spiral inward. What do you wish to let go of, receive, pray for, become more of, etc.? 2. Listening for, and receiving your wisdom, information, illumination, answer or blessing from within the center. Stay here as long as you wish. 3. Acknowledging that all is now unfolding in divine timing, and offering up heartfelt gratitude as you wind your way back out into the “real world”. In other words– here you may take time to find “that still small voice within”. Here all are welcome. 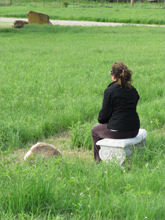 Contemplation is a vital part of every tradition on the planet, and we honor the wisdom of all traditions. There are many ways to walk and many ways to pray. Allow yourself your way. There is no “right” way. If you want to cry, allow yourself the tears; if you want to laugh, allow that as well; each person reacts to the labyrinth differently. It may not be a “feel good” or moving experience for everyone every time, but as you stick with it– returning over time– it will change you, and you will come to find your peace. Hours: Mon-Fri: sun-up till sunset, Sat-Sun: sun-up till 4pm. No need to call first, unless you have special group considerations. Admission– free. * Please park at the bottom of the driveway as directed by the sign. * Walk along the fence line to where the message board is, then follow the path as directed by that sign. * And please do not disturb residents. This thing stays doable for us, and will remain available to you, only so long as we can maintain our schedule and commitments. For more information call (785-887-1030) or email Joan or David to schedule. Click here to download Full-Color Flyer in pdf format (~540kb). 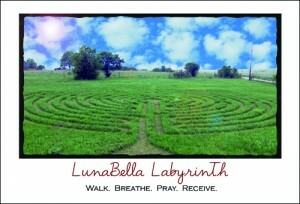 Includes map, directions, rules/guidelines, the story of LunaBella labyrinth, etc. Can’t get here to walk LunaBella Labyrinth? 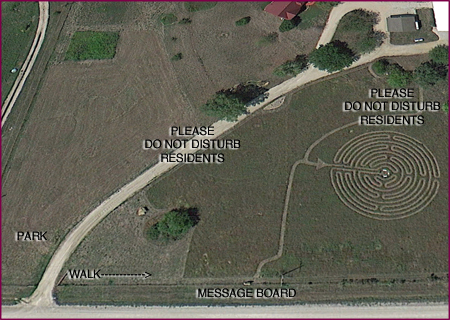 Then Click here to download a LunaBella Finger Labyrinth (pdf, 1.3mb)! Print it off, trace the path with your finger and achieve the same effect from wherever you are! If you got here by way of a search for LunaBella Labyrinth and wish to know more about us, this is the website of Joan Clark. We hope you will look around and learn of all-natural Perfumery and Aromatherapy by way of the Goddess Aromaetica, Pet Alchemist all-natural petcare and other lines; empowering classes and retreats for women; sacred travel; Joan of Art; intuitive, holistic healing treatments and more. For the work of David please visit www.dbhealer.com, www.oneworldflag.org, and www.hyphenate.org. One Sunday per month we have a free Powerful Passionate Women for Peace 1-hour conference call where all interested parties (up to 50 and more), of any belief system, come together to call in prayers for themselves and/or others and/or the planet in general. All that is required is that one bring his or her heart and good intentions… and Spirit does the rest. Email to express interest and receive the information for our next call. Any of my sessions may include aromatic alchemy. 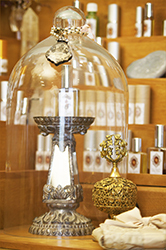 I use essential oils, flower essence, aromatic tinctures, aromatic mists and natural fragrances to assist in the moving of energy and the integration of the treatments. Important Note: Many people do not realize that an energy or healing session could be equated to having a surgical procedure. You might open up any number of the mind/body/spirit’s fields, and these need time and attention to integrate. This is crucial. So– please allow yourself sufficient time on the day of your treatment for assimilation/completion/closure and self-nurturing. Our bodies, our highest selves know how to do this very spiritual work: so allow them to do it, to maximum effect. Namaste’.